When Star Wars Episode VII comes out, it’s funny to think about how it won’t be the seventh film in the series to debut in theatres. No doubt nitpicky players of trivia games will forever be using Star Wars: The Clone Wars as the answer to the trick question, “What was the name of the seventh feature film in the Star Wars series to be released in theatres?” and arguments will then ensue over whether or not the movie actually counts as being part of the saga. Friendships will be destroyed. Families torn apart. Star Wars: The Old Republic servers will crash with the onslaught of flame wars erupting. The thing is, The Clone Wars really isn’t actually even a real movie – it’s a last minute pastiche of multiple episodes and story arcs that originally made up the start of season one of the animated series that also bears its name. The only reason this was even released theatrically is because George Lucas was blown away by the footage he decided to have the team string it together in time to cash-in and get the word out about a new surprise Star Wars movie that was likely hoped to earn a massive amount of cash at the box office. It was, in fact, a modest success and likely got the word out regarding the upcoming TV series that would follow, but the last minute decision did mean that merchandising partnerships for the movie were unusually sparse for the franchise. Even worse, however, was that the rush to get it to the theatre and the stringing together stories and scenes originally intended to span multiple 30 minute episodes (including commercials) led to what is now the least critically acclaimed Star Wars film of all time. The movie’s TV origins can easily be distinguished by the fact that it could easily be divided up into 3 smaller story arcs: a battle between the Galactic Republic and the Separatists on the planet Christophsis, the race to be the one who can claim rescuing Jabba the Hutt’s son, Rotta, from kidnappers and gain access to Jabba’s support in the war, and an investigation into the conspiracy that led to Rotta’s kidnapping. It’s easy to see how these could have flowed more easily in the 30 minute time format, with one or two of these arcs spanning two-parters, given the amount of stuff going on, but as a film, this introduction to The Clone Wars winds up feeling incredibly uneven in tone and pacing, while each arc winds up feeling rushed, the film only having time to show us the best bits of action and comedy before it sends its characters and audience hurtling into the next. The live action prequels were certainly longwinded and slow, but this midquel, by comparison, will give you whiplash! If you can compose yourself enough, however, there are a few standout moments in the movie that are fairly entertaining. The series would become famous amongst fans for finally portraying with intimate detail what it’s like to be a Clone Trooper serving in a war where the people on their side would frequently see them as mere cannon fodder, and while the movie in particular doesn’t quite get there just yet, the few moments we do spend with these seemingly identical men are surprisingly visceral, as we see them go into combat with pride and honor, sometimes at the cost of their own lives. The movie is far from showing us the horrors of more visceral war movies – it is aimed at the family audience, after all – but it’s still relatively shocking to see the violence and sacrifice these Clones go through just by virtue of the film not being required to constantly be concerned with Anakin’s fall. Speaking of which, Matt Lanter is a far more charismatic and likable Anakin, and if you can overlook some of the lame dialogue the script gives them, the voice actors in general are quite good in their respective roles (and they would only go on to get more comfortable as the series went on, as well – James Arnold Taylor merges Ewan McGregor and Alec Guinness’ portrayals of Obi-Wan into his voicework masterfully). The film’s most intimidating villain, Asajj Ventress, is also a delightfully evil and fearsome Sith warrior, one that fans of the unrelated (but awesome) Genndy Tartakovsky Clone Wars miniseries will delight in seeing return, and the newly introduced masses will also likely enjoy watching her as she takes on all three of our Jedi heroes in combat. Yeah, I said three Jedi heroes. You see, The Clone Wars also introduces us to Ahsoka Tano, the heretofore never mentioned or referenced Padawan learner to Anakin Skywalker during the Clone Wars and the series’ spunky token girl character with a habit of coming up with annoying nicknames for everyone. (Anakin is “Skyguy,” for example, Rotta is “Stinky,” and R2-D2 is… “Artooie”… Yeah….) Let me preface this by saying that Ahsoka would also later become one of the franchise’s most memorable, well-developed, and overall likeable characters, but that took more than one season to pull off, and here in the beginning, there’s little doubt that this accident-prone sass-machine is anything but an annoying cashgrab. More than any other character in any of the films, even including Jar Jar Binks in Episode I, Ahsoka was clearly created just for the child-centered marketing opportunities having a cute, young female Jedi lead would offer merchandizers. The humor in general is pretty miserable across the board, though you might get a few guilty chuckles from the dimwitted Battle Droids. (It’s hard not to smirk at the fading electronic scream of “WHY! ?” as a wayside droid is Force pushed off a cliff in frustration by Ventress.) Ahsoka’s banter with Anakin is clearly meant to remind us all of the lively script of the original trilogy, but it’s so poorly written and the character is so grating, it only registers as being barely better than the prequels because, unlike their live action counterparts, the voice actors were at least given permission to emote. While the film lacks expected Jar Jar antics, Rotta the Hutt (a.k.a. “Punky Muffin” to his crime lord father, the once intimidating Jabba) provides us with plenty of flatulence jokes. Another newly introduced character, Ziro the Hutt, also became the center of some mild backlash due to the perceived projection of negative gay stereotypes upon the glammed-up character, whose speech and body language isheavily reminiscent of Truman Capote. Like this early Ahsoka and Rotta, however, it’s really more offensive that he’s just not that interesting as a character. I can completely understand why film critics would give the film such low scores, even when the prequels are themselves generally pretty awful. 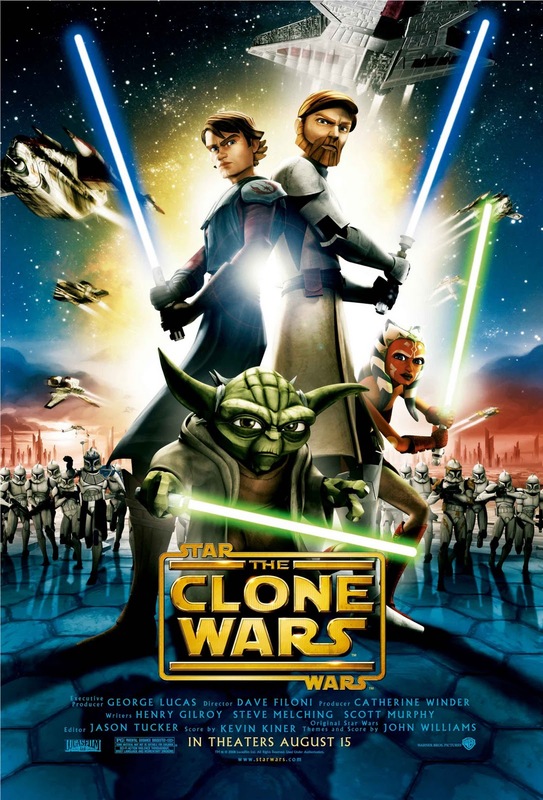 The Clone Wars, as presented in this format, is undoubtedly a disappointment to anyone who was expecting the quality of the main films translated to Pixar-quality animated form. At the same time, it’s almost unfair to criticize it so harshly, too, when it wasn’t even meant to be a film in the first place. It probably would have been a perfectly serviceable set of introductory episodes to a TV series, rough though they may have been (and what TV series doesn’t have its hiccups in season one?). The best thing about this film, however, is that it shows us that Star Wars can and will live on in other formats, and this likely did a good job of bringing to the masses the idea of Star Wars as not being just a film series with merchandize tie-ins. We’ve seen animated series, books, video games, and comics expand upon the universe before, sure, but The Clone Wars is likely the first time mainstream audiences familiar with only the first six episodes were given a taste of the Expanded Universe. The movie wasn’t necessarily a box office failure, and the following that the subsequent TV series gained has also ensured that Disney, too, sees the value in continuing it beyond just the episodic film format, as evidenced by the upcoming spinoff films and Star Wars Rebels, which is being worked on by The Clone Wars’ crew and features an entirely new cast at its core. Yeah, Star Wars: The Clone Wars isn’t a good film, but I’ll hand it to George Lucas – it was probably the best way to help the franchise grow. Probably the best decision he made with the series in a while.